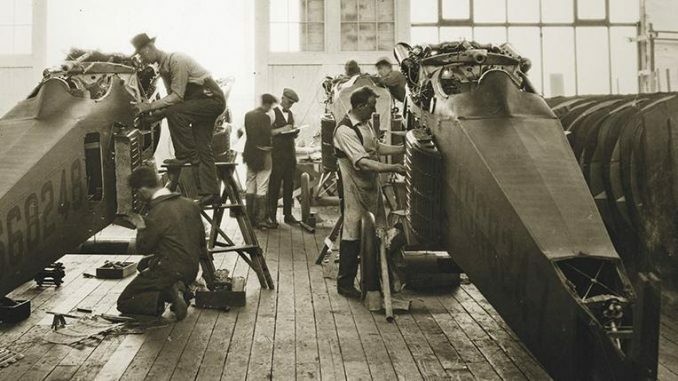 Working on airplanes in the original Boeing factory in the 1910s. PRESS RELEASE – Winter is sensational at The Museum of Flight, with lively weekend celebrations of the 2016 centennial of The Boeing Company. Centennial weekends will send you into another decade beginning with the early 20th century on Jan. 23, the Roaring Twenties Feb. 13 and the Troublesome Thirties March 12. 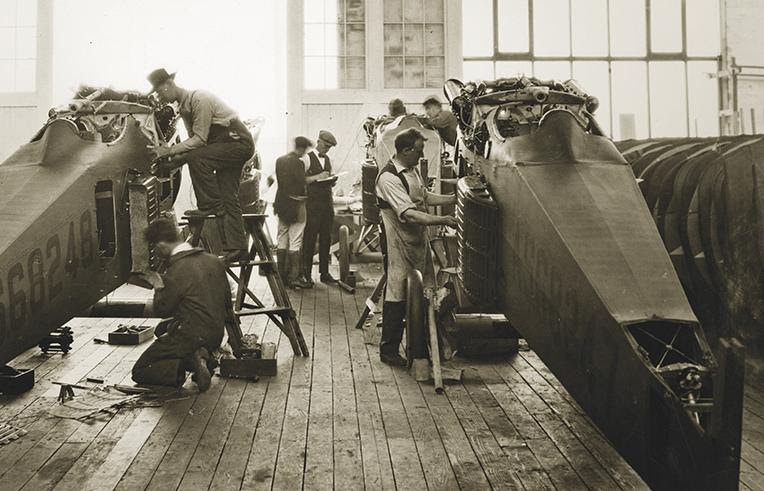 Explore the culture that shaped great moments in The Boeing Company. Indulge in some time traveling with live music, movies, dance, performance-and some food and drink-from each era. There’s even lectures, fly-ins and new exhibits for the aviation geeks! 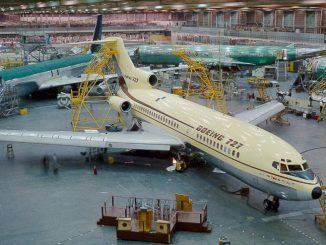 Ask not what is Seattle without Boeing, ask what is Boeing without Seattle. Have some fun this winter with this century of sibling rivalry. Remember, Museum Members receive special invitations for our evening events featuring music, dance and signature cocktails! While World War I was “over there,” Boeing started over here. The company’s original factory comes alive with living history performers as wing weavers, pilots, wood workers and machinists. The Boeing Band tailors their tunes to the nineteen-teens, and the Great War is recalled with a screening of the classic film “Dawn Patrol” (and see the real flying jacket worn by Errol Flynn in the movie, not to mention one of film’s planes also on view). The always-amusing aviation historian Mike Lavelle will lecture about the origins of Boeing airplanes, and non-birders will learn the heart-breaking take of the War’s intrepid Pigeon of Valor, Cher Ami. There’s the wartime angels, the Salvation Army Lassies, doling out Top Pot donut samples, and it’s all capped with wild music of Seattle’s Balkan brass party band, the Bucharest Drinking Team. Flapper alert! It’s the Roaring Twenties with jazz age music, dancing, airmail valentines and a troupe of living history performers. Wear your best pearls and snappiest spats to our screening of not one, but two versions of “The Great Gatsby,” (1974 and 2013). Not forgetting aviation, Addison Pemberton, the builder and pilot of the world’s oldest flyable Boeing, the 1928-vintage Model 40C, will tell you all about this plane that put Boeing on the map. If “every time it rains it rains pennies from heaven,” Seattle should soar through any depression. 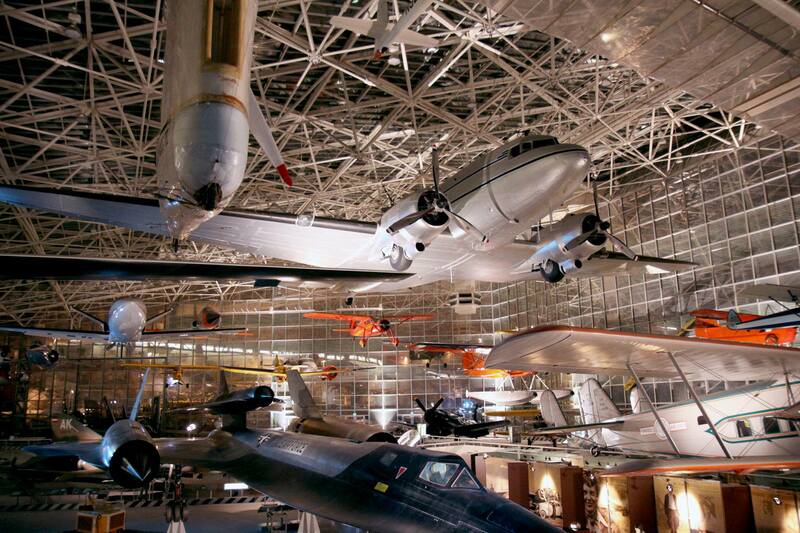 Experience aviation during Seattle’s Great Depression through music and eats of the era. Prohibition is over, so lighten up for Fred Astaire’s musical movie “Flying Down to Rio.” Talk to author SJ McCormack about how she researched the historic characters for her book, “Night Witch.” And pose with our pretty little P-26 Peashooter pursuit plane.